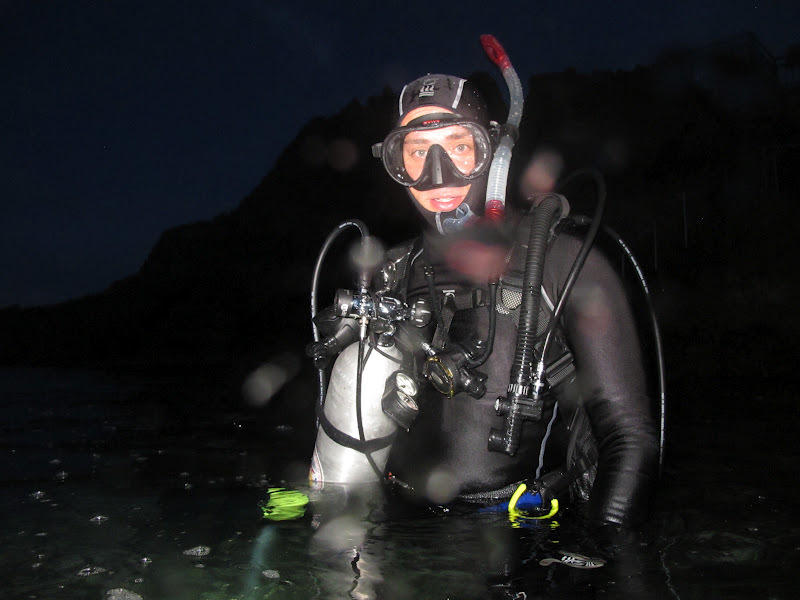 James and I have been on a kick for night dives recently. After visiting various sites along the Sunabe Seawall, we decided to visit Maeda Point for a change. We had an absolute blast diving together and we were able to see some new wildlife. When we arrived at Maeda Point, the parking lot was closed so we found a spot along a side street. We walked over to the steps to make sure the water was calm and it looked perfect. 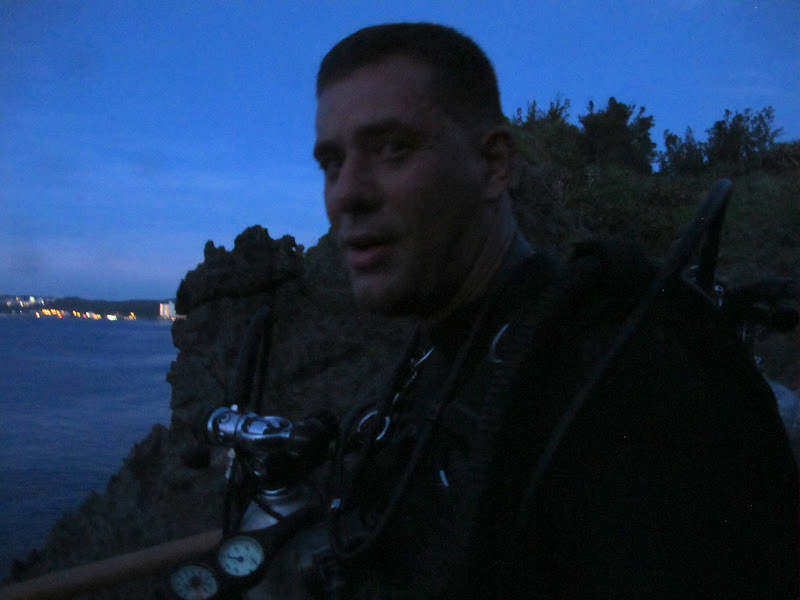 Excited to start diving, we hurried back to the car to kit up our gear. After doing a thorough buddy check, we walked down the stairs and into the water. I lead the dive and we headed to the north along the reef wall. There was absolutely no current or surge so our dive was super relaxing. 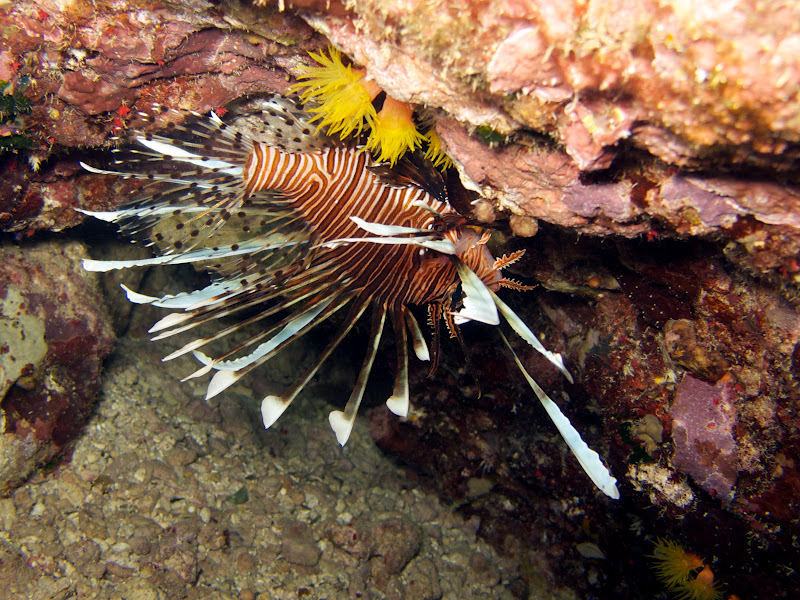 As we came down the chain to a depth of 20 feet we were greeted by a zebra lionfish. I don’t think it was “sleeping” because it started to swim away as I approached. Luckily, I managed to get a few nice pictures of it. 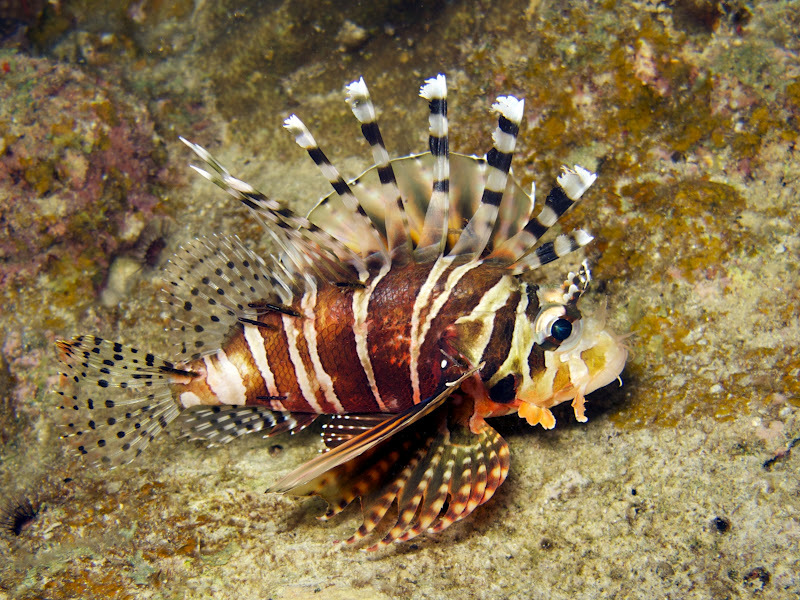 Zebra lionfish tend to be smaller (18 cm – 7 in) than regular common lionfish (35cm – 14 in). 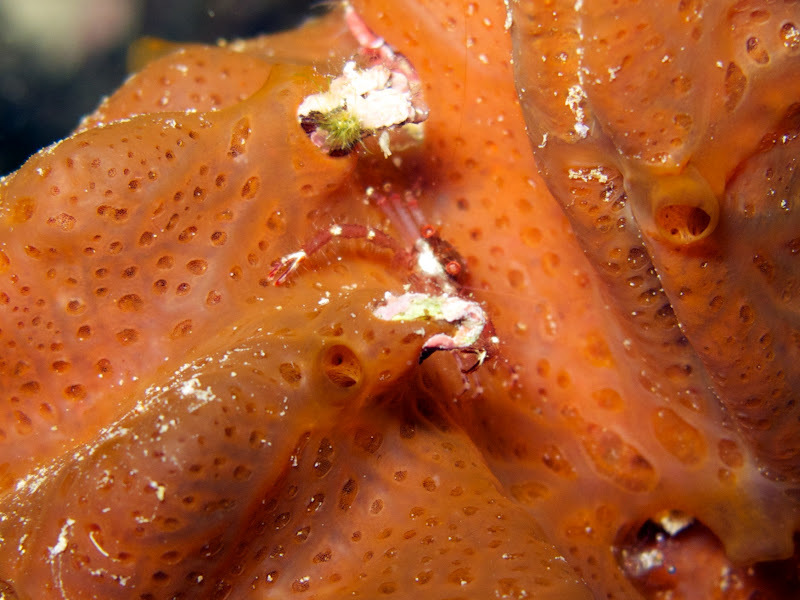 Their coloration also tends to be more orange. Between the spines on the pectoral fins of the zebra lionfish there is also a transparent film which is absent from the common lionfish. While researching the zebra lionfish I learned that they are very territorial. 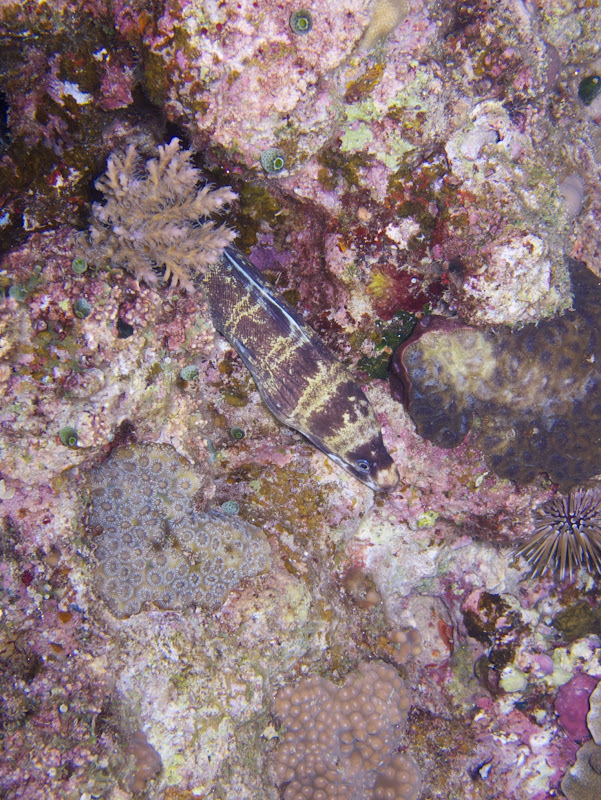 If a male swims into another males territory it will be cautioned to leave the area due to the darkening color of the lionfish. We also spotted a really neat looking crab (I love the blue highlights on his claws) and he didn’t scurry off, allowing me to get 2 nice photos. After the crab ducked into a crevice, James and I continued swimming north along the reef wall. 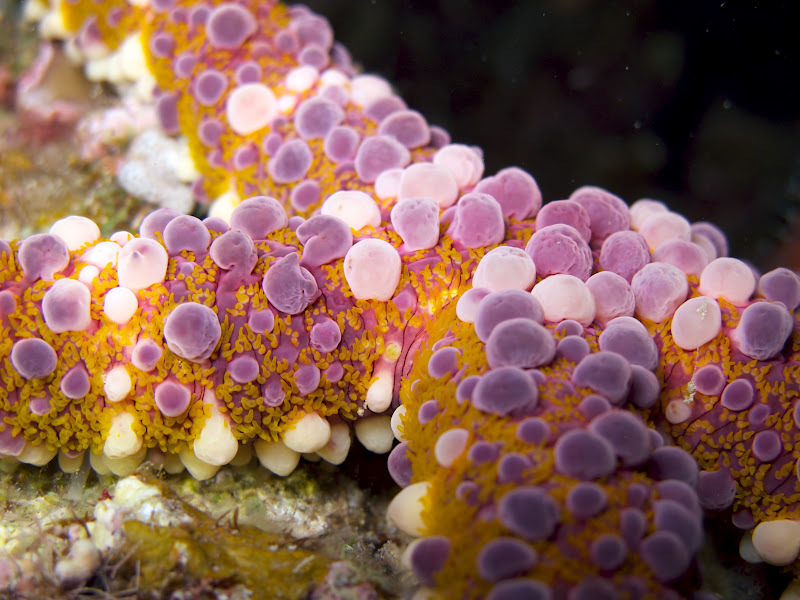 I kept my light on the reef and looked for opportunities to shoot macro photos. Meanwhile, James used his brighter light to cover a larger area. All of a sudden I saw his light moving side to side in an attempt to get my attention. I turned aroung and he pointed his light to a massive cuttlefish that as located along the sandy bottom in between two fingers of coral. What a great find! James and I slowly approached, and I began taking photos. 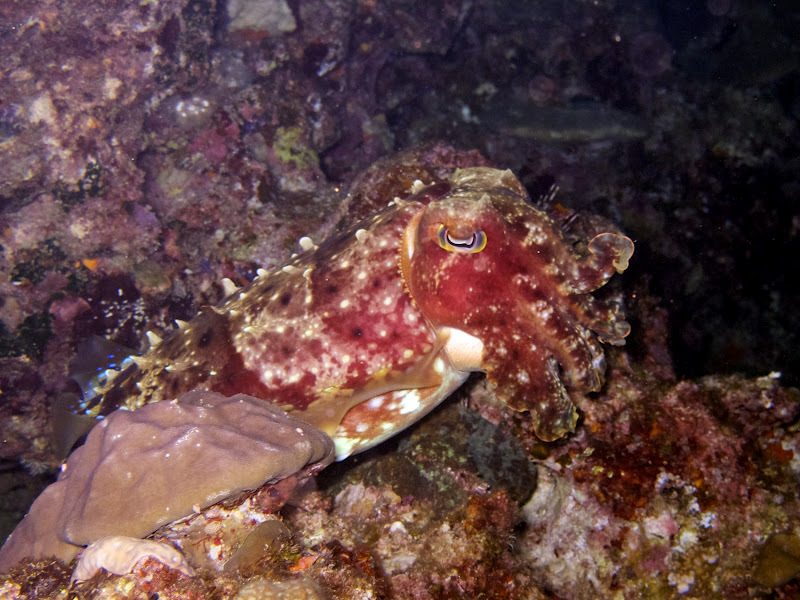 As soon as our light were shining on the cuttlefish, it immediately began changing colors – going between white and red. I understood the red color to signify that the cuttlefish was getting upset so I motioned for James to stop shining his light directly on it. 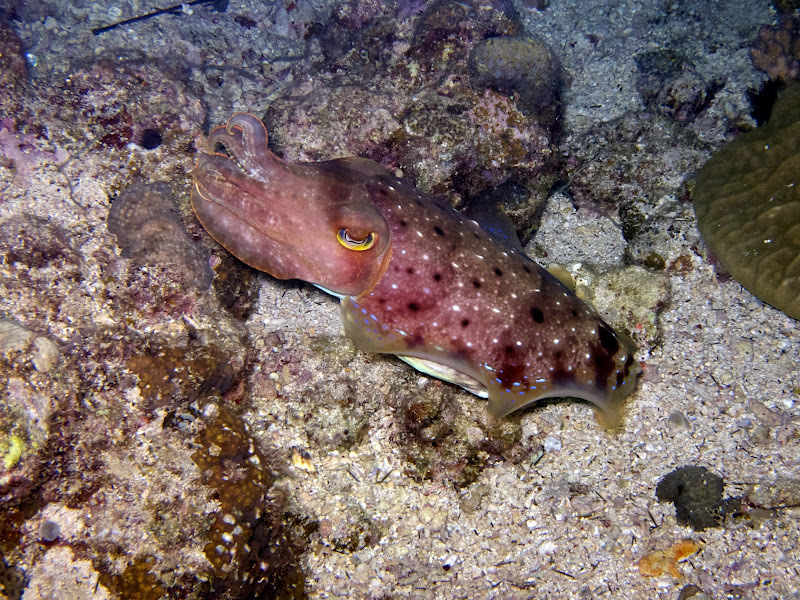 The cuttlefish seemed to relax a bit after we did this, but it had enough of my camera flash going off. It moved up along one of the coral fingers and tried to blend it….and it did a pretty good job. 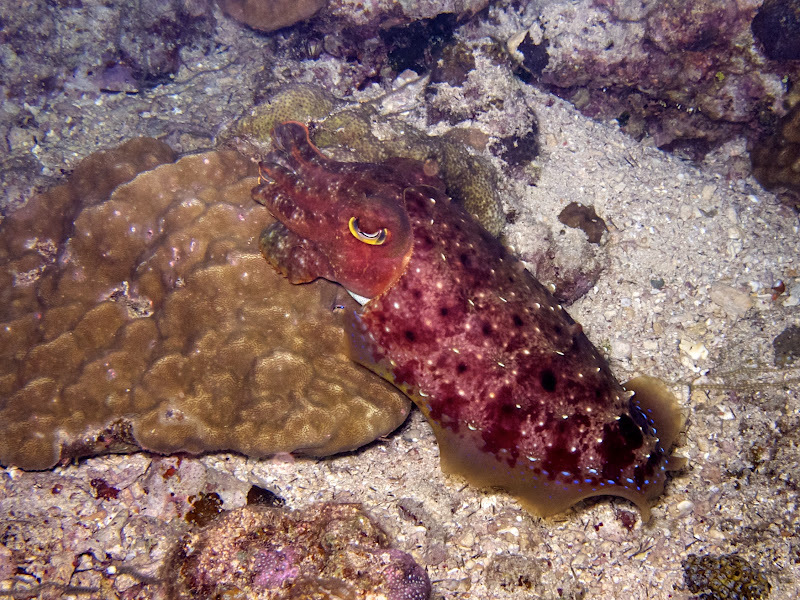 After about 15 seconds of trying to camouflage itself, the cuttlefish gave up and swam away. James and I turned toward each other after the experience and pumped our fists with excitement. We continued our swim northward and as I scanned the reef, I noticed a strange, flat object swimming towards the sand. I approached it cautiously and then realized it was some sort of fish. I took a ton of photos because I had never before seen such a fish…I wanted to make sure I had some good photos that could help me identify it once back home. It turns out that this fish was a Banded Sole. 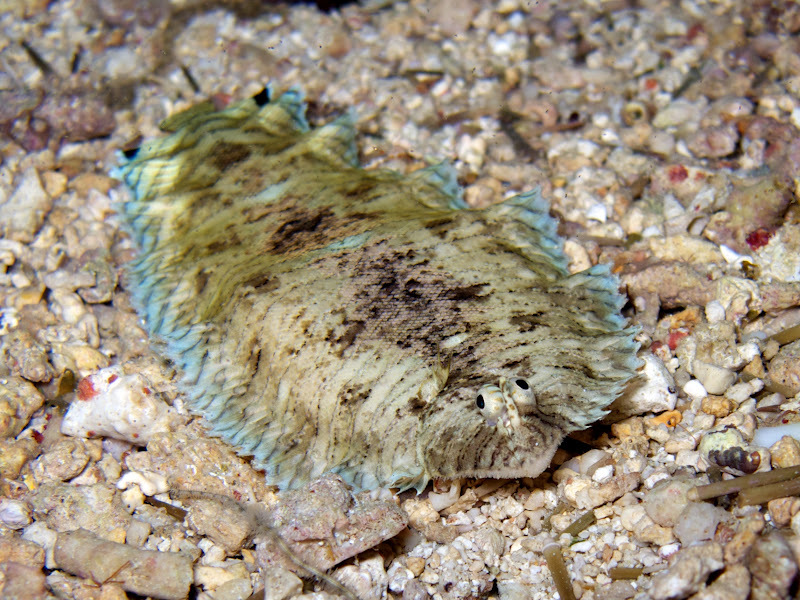 The blue coloration on the border of the fish helped in making an ID. 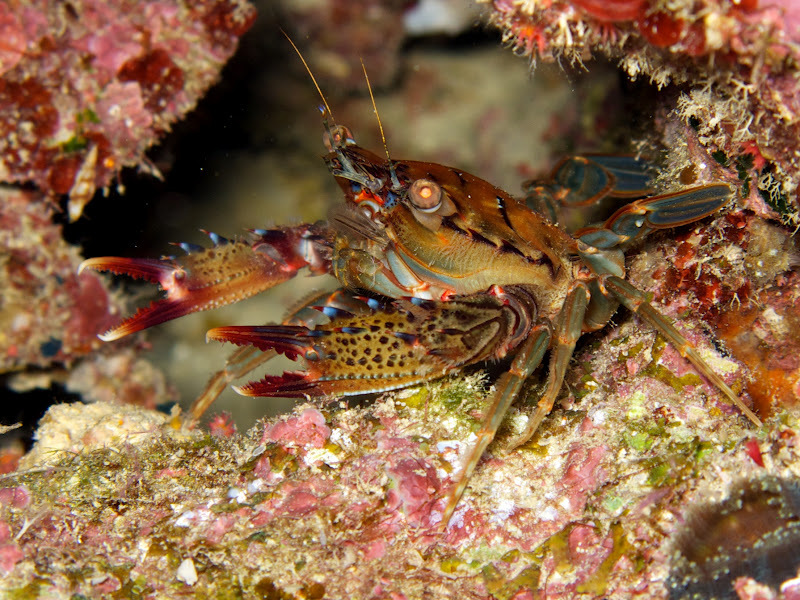 I love finding animals to take macro photos of so when I spotted a very small crab (below photo) on the reef, I instantly started taking pictures. James came over and took a look and then waited while I snapped away. I think this might be an arrow crab but I’m not 100% positive. Following our encounter with the arrow crab, we spotted numerous critters that I’ve never seen before. 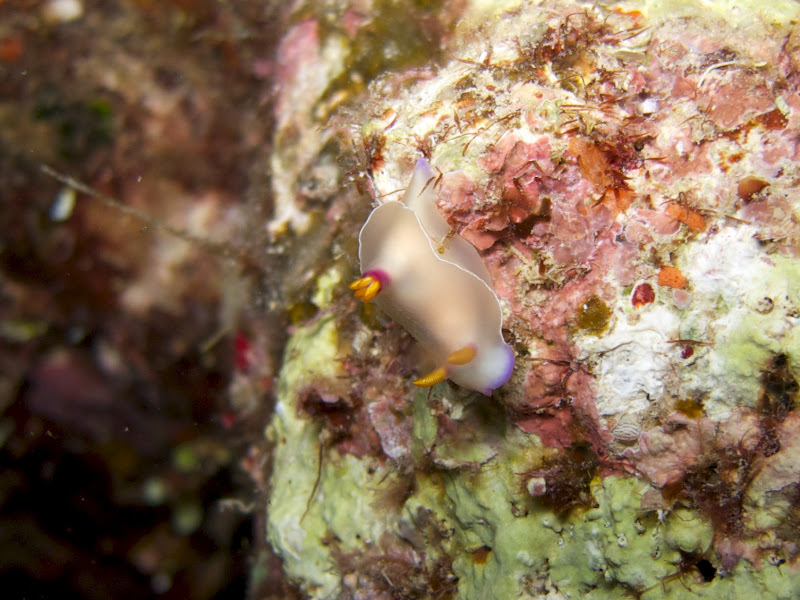 The first animal we came across was some sort of flatworm. 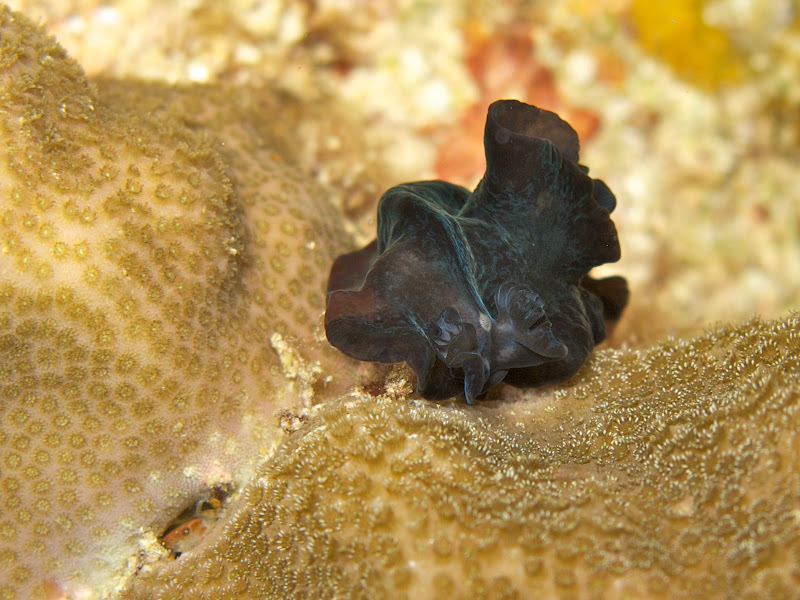 I posted a photo of it on “Marine Flatworms” on facebook and I’m hoping someone there can give me some guidance on its scientific name. 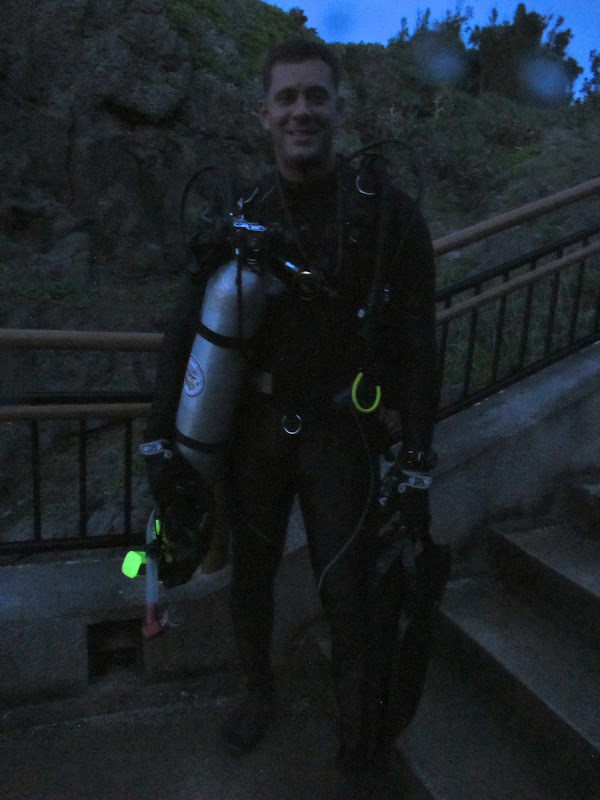 It appeared to be all black and didn’t appreciate when my dive light was shinning on it. I snapped some quick photos and then moved on before it became upset and swam away. The next critter I spotted was a TINY, TINY crab. Unfortunately, I wasn’t abled to get my camera to focus on the crab because it was so small and it was nestled into a tiny crevice. 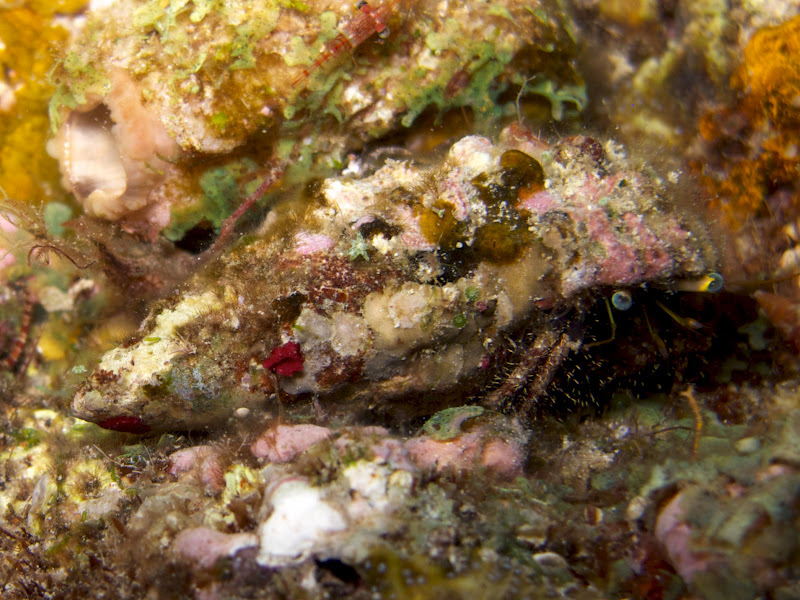 If you look carefully at the below photo you should be able to spot the crabs claw and its two, red eyes. It kind of looks like an alien, right?! About 2 minutes before turning around to head back to our exit point, James and I came upon a really awesome looking starfish. It had little bumps that were purple and white colored with little “hairs” that were orange. I don’t ever recall seeing this type during the day (I’m not really interested in starfish so maybe that’s why I don’t remember seeing it) so I got in close with my camera. After spending about 25 minutes moving slowly along the reef, James signalled to me that he only had 1500 psi left in his tank. We turned around and started heading back. Within just a few minutes, I noticed something wiggling through the rocks below me. At first it looked like a snake so I slowly moved my light onto it, but I was pleasantly surprised to find that it was an eel. 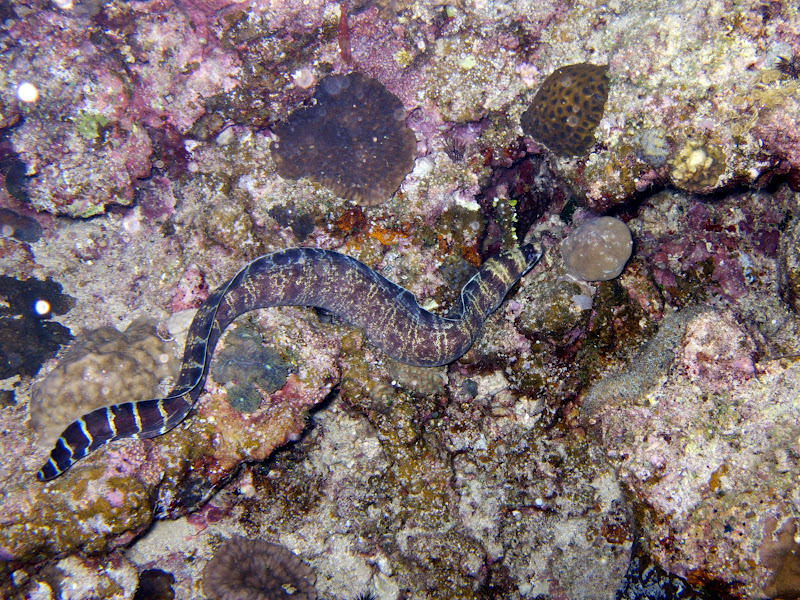 I’m still not sure exactly what type of eel it was that we spotted. James and I followed the eel as it moved in and out of the rocks looking for food. Surprisingly, it didn’t seem to care about our presence; however, because it was constantly moving around I wasn’t able to get any terrific photos of it . After a few minutes of following the eel, James and I decided to continue on with our dive. 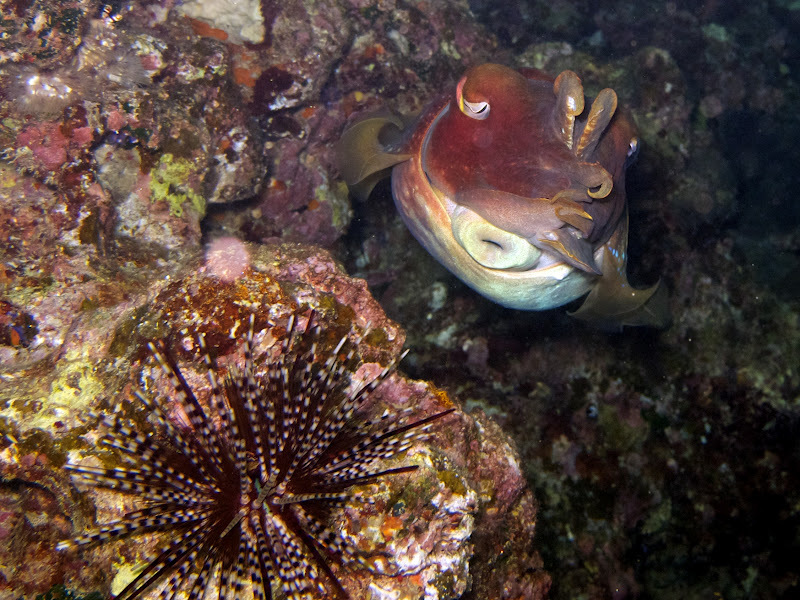 As our dive came to its end, we managed to spot several cute fish that were “sleeping” in the rocks. 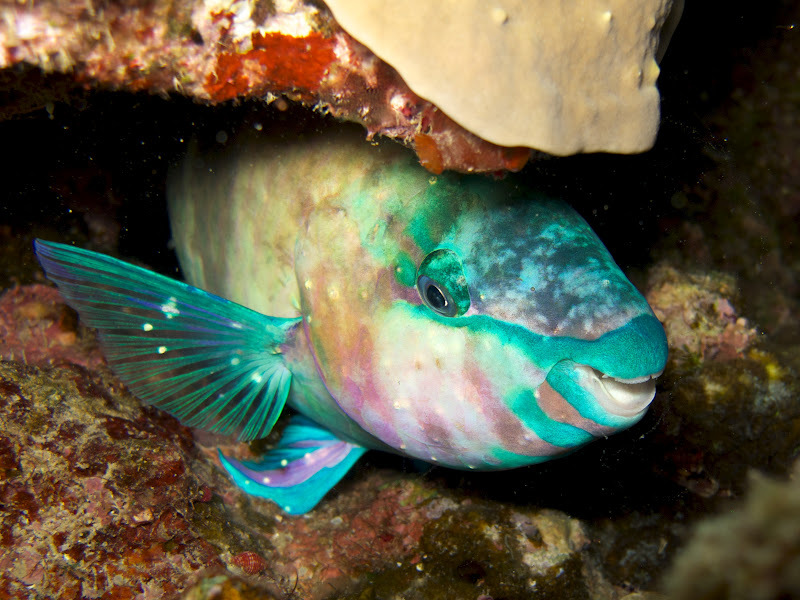 The first was a rather large parrotfish that had wedged itself in between some rocks. I was able to get in very close with my camera and I absolutely love the colors in the below photo. 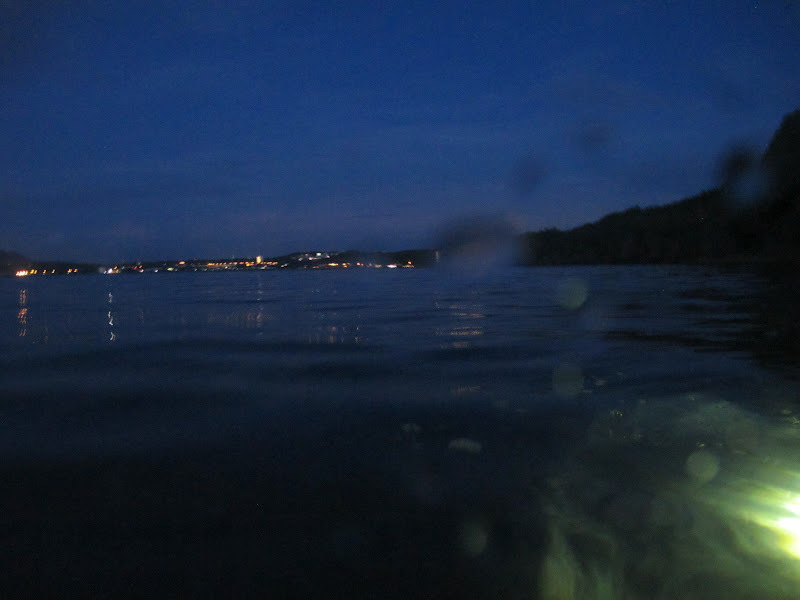 Underwater photography at night always seems to turn out so much better than my daytime photos. During our safety stop at the metal chain I continued looking over the rock and manged to spot two last-minute animals. 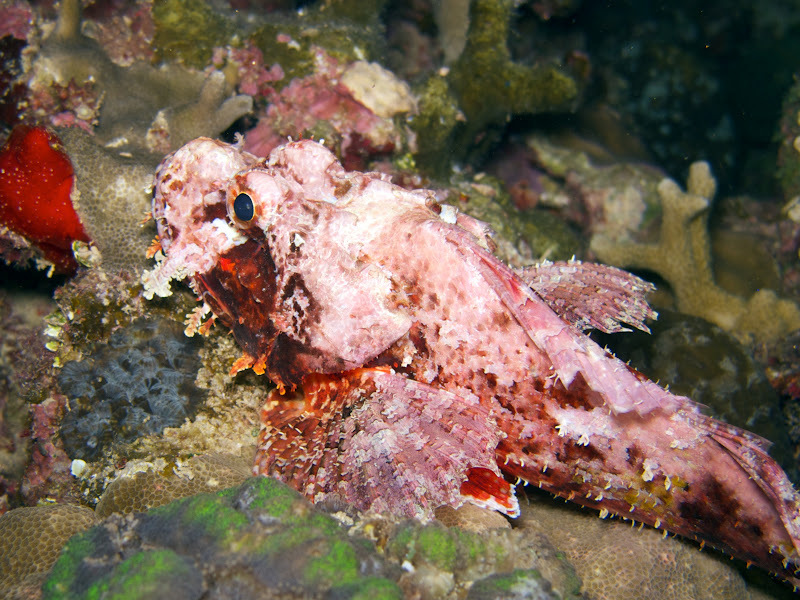 The fist was a pink and red tasseled scorpionfish. It wasn’t very well blended in with the rocks surrounding it….really makes it pop out in my pictures. The last animal we saw was a hermit crab. He was very curious as to what I was doing and didn’t tuck into his shell as I approached. 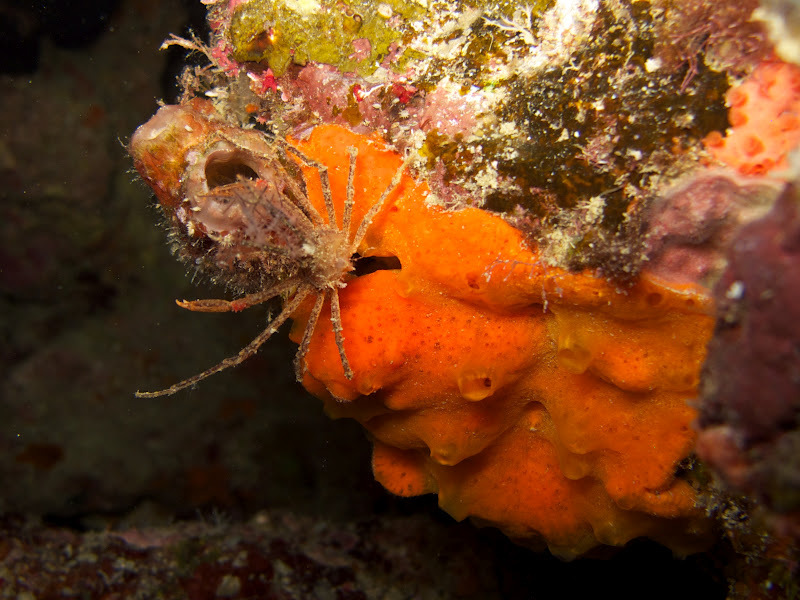 It seems that at night the hermit crabs become more courageous than during the day when they hide instantly upon your approach.